Now I ask you, does it look like this woman needs any more chicken - grilled, fried or otherwise? No, I think not. And she may have just set race relations back a decade by shilling for Kentucky Fried Chicken. But I digress. If you're not aware of what I'm referring to, allow me to hallucinate. KFC has come out with a new line of "grilled" chicken. Commendable, considering they've only now decided to hop on the "eat healthy" band wagon that their competitors reluctantly initiated about 15 years ago. Enter Oprah. In an act of kindness (yeah, right, there's a deal in there somewhere) Mrs. Television directed viewers to her website where they could download coupons for a free grilled chicken meal. The promotion was so successful KFC ran out of chicken in some centres and had to issue rain cheques. 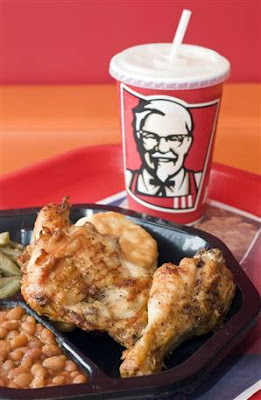 Over a matter of days KFC issued over 4.5 million free meals before having to temporarily suspend the promotion. Nevertheless, KFC says it's extremely happy with consumer response. All I can say to KFC is be careful what you wish for. Oprah used to give away cars and look at what's happened to that industry! I saw a commercial with some doofus saying they had to suspend the deal. I had no idea what they were talking about till now, because I make it a point to ignore everything Oprah has to say. Ack! Now I feel having me some fried chicken (forget the healthy grilled stuff)! I tried to redeem that coupon. 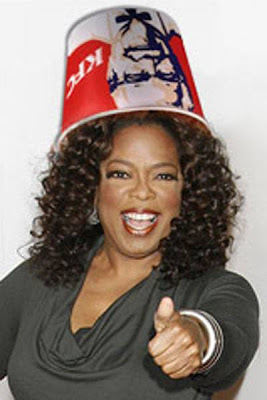 They were out of chicken here too, but I don't think it was Oprah. I think it was payday. CB: It wasn't this dufus! Qyuirky: Bleck, I wouldn't touch that stuff. JT: That's exactly where all this was going. Thanks! I wish Oprah would mention me on her website. If it's oprah approved, it's gold, even if i make fun of fat housewives. Just cuz Oprah said it was good. Mike: And she's such an easy target.